With North Korea's third nuclear test, one of the world's most vexing problems has taken a turn that presents Chinese diplomacy with perhaps its greatest challenge in a generation. This editorial from China's state-run Huanqiu offers a glimpse into the debate in Beijing about how to 'penalize' Pyongyang, and whether now is the time to take part in sanctions being imposed on North Korea by the U.S., Japan and South Korea. 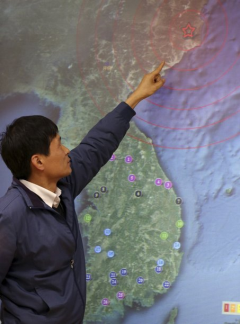 An official points to Kilju in North Korea, where the North conducted a nuclear test, at the Korea Meteorological Agency in Seoul, Feb. 12. The United States, Japan, South Korea and Europe have issued strong signals that they will impose severe sanctions against the Democratic People's Republic of Korea. Meanwhile, the DPRK may accelerate the process of nuclear miniaturization and so equip its troops, Japan will follow suit with U.S. backing, and Europe will assist. For China, however thankless, involvement will be impossible to avoid. Washington, Tokyo and Seoul are anxious to see China change its policy toward North Korea, and continue to apply pressure to that end. 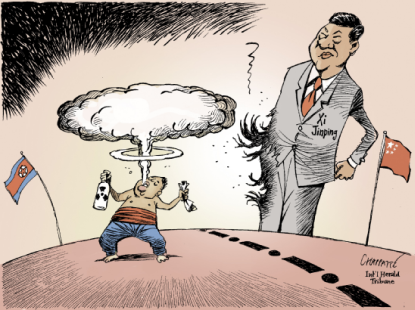 Because Pyongyang's nuclear activities undermine China's interests, it is necessary for it to impose certain "penalties." The key issue for China is to decide what the extent of such penalties will be. North Korea is determined to possess nuclear technology. During the years of Six-Party Talks, the United States, Japan, along with South and North Korea, failed to seize the opportunity to achieve a genuine easing of relations among themselves. The issue has passed a critical juncture. The confrontation between North Korea and the United States was so sharp, neither the U.S., North Korea or the others are likely to return to the talks. North Korea has a "fight to the death" mentality when it comes to its efforts to build nuclear weapons. Even if China fully backs sanctions being proposed by the U.S., Japan and South Korea, the denuclearization of North Korea is unlikely to be achieved. And if Beijing alters its position toward Pyongyang too rapidly, it would become the central variable and focus of attention in the entire situation. This must be avoided. This is very much in the interests of the United States, Japan, and South Korea. And at least for a time, China would become North Korea's leading adversary, which brings to mind what happened with the Soviet Union and Vietnam [With both countries, close ties eventually soured leading to armed conflict]. If China, the United States, Japan and South Korea form a group, this is what is likely to happen between China and North Korea. China cannot be considered a North Korea ally, but at no point should China turn North Korea into an enemy, especially as it is crossing the nuclear threshold. This should be the strategic bottom line of China's North Korean policy. However, China should be bold enough to put action behind its opposition to Pyongyang's nuclear activities. Otherwise, Pyongyang will take it for granted that China will be on its side, and even mistake Beijing's position for fear. The international community will not accept China's blind protection of North Korea. We contend that China should "punish" North Korea, but the severity of the "penalty" should not exceed the sanctions being imposed on the DPRK by the U.S., Japan, South Korea and Europe. That is, it should reduce its assistance to the North. Anything else would attract the unwelcomed attention of Korean and global public opinion. This should be China's bottom line for participating in international sanctions against the DPRK. The North Korea nuclear issue is extremely complex and the peninsula remains in a state of Cold War. For its own reasons, some geopolitical, North Korea failed to benefit from previous attempts at reform and opening up. The West tends to perceive the North Korea issue from a largely ideological perspective, and the United States has its own strategic considerations when it comes to the peninsula. If Chinese public opinion falls in line with the United States, Japan and South Korea, it will cause perceptions of China's interests to go astray. Too much tension has accumulated on the Korean Peninsula, and the nuclear issue has become a time bomb. North Korea must assume blame, but the United States, Japan and South Korea are just as responsible. It is extremely unreasonable for Washington, Tokyo and Seoul to demand that China change its attitude toward North Korea, but make no changes themselves. Opera Mundi, Brazil: Can America Secure a North Korean Nuclear 'Reversal'? China should stick to being a reconciler and harmonizer on the nuclear issue, and not join one side in confronting the other. It is unlikely that China will become allies with North Korea, but it is even more unlikely that it would join an alliance with the United States, Japan and South Korea. China mustn't sleepwalk and be dragged along with the U.S., Japan and South Korea. With the North Korea nuclear bomb program gradually taking shape, it may try to use its nuclear activities to break its isolation and change the attitudes of the United States, Japan and North Korea. It may be that diplomacy will fail and tensions on the peninsula will further escalate and lead to war. China must prepare to cope for the most extreme situation on the peninsula. It is important to safeguard its own security and not be held hostage by either side. China is not in a position to undertake a large-scale adjustment of its North Korea policy. But that doesn't mean there will be no changes or adjustments. Now, facing a reckless North Korea and an anxious U.S., Japan and South Korea, China must act to maintain a robust and dynamic Northeast Asia strategy.